The Micro Four Thirds-mount SLR Magic CINE 17mm T1.6 is a fast wide-angle lens that is ideal for both photography and videography. It features a solid metal construction, which houses ten aperture blades for beautiful bokeh in out-of-focus areas, and de-clicked aperture control for silent adjustment. 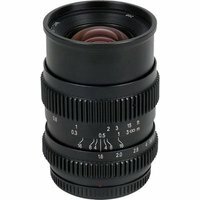 This Micro Four Thirds lens is suitable for Olympus, Panasonic, and Black Magic cameras.